Bad breath (halitosis) is an embarrassing problem that can cause social awkwardness, embarrassment, and anxiety. Remedies for bad breath help reduce the number of bacteria and germs in your mouth that can be causing your breath to stink. Natural ways to get rid of bad breath include a saline mouth rinse, baking soda mouthwash, and practicing good oral hygiene. In some cases, to cure bad breath you need to address any stomach or oral issues you may have. If gastrointestinal problems are the cause of halitosis, then probiotics, digestive enzymes, or activated charcoal can help permanently resolve bad breath. Chewing peppermint gum, drinking plenty of water, or rinsing with baking soda can all help to freshen breath, at least temporary. If your bad breath is a result of a gum disease, go to see your dentist. Gum disease is a common cause of bad breath and a dentist will be able to advise a suitable treatment. If you wonder why your breath smells bad all the time, this article will help you understand the reasons for bad breath. You will also learn about some of the best natural bad breath cures. Halitosis is the medical name for unpleasant odors from your mouth, in other words – bad breath. Some bacteria can cause sulfuric compounds to form in the mouth that make your breath smell like rotten eggs. Although not in the stomach, tonsil stones can also cause bad breath. Learn more about tonsil stones and how to remove them to get rid of halitosis. Let’s look in more detail at some natural treatments you can use to cure bad breath. It is good to remember, that persistent bad breath or constantly having a bad taste in your mouth could be a sign of periodontal (gum) disease. In these cases, many of the bad breath remedies here will only be a temporary solution until the gum disease is treated. At the end of the article, you will find out when you should see a doctor or dentist for bad breath that doesn’t go away with natural remedies. One of the most important ways to cure bad breath and help ensure your breath smells fresh every day is to clean your teeth properly. Brushing your teeth at least twice a day, cleaning your tongue, regular flossing, and using a plaque-reducing mouthwash are just some of the recommended ways to practice good oral hygiene. Find out if you are making any of these common teeth-brushing mistakes. Rinsing your mouth with a saline rinse is a cheap and easy way to kill off bacteria that can cause smelly breath. You can easily make your own saltwater mouthwash for bad breath. Dissolve a teaspoon of salt in a glass of warm water. Swish the saline solution around your mouth for a minute to kill off bacteria and help freshen your breath. Learn how a saline mouthwash can help treat gum infections naturally. Another way to help stop your breath smelling bad all the time is to use aloe vera for its antibacterial properties. Aloe vera is a well-studied plant that is used to treat wounds, kill off infections, and reduce inflammation. You could put some aloe vera gel on your toothbrush and brush your teeth for a few minutes to help reduce plaque. Or, you could dab some aloe vera gel on inflamed parts of your gum to help speed up the healing process. You can also make your own aloe vera mouthwash to treat bad breath. Mix a teaspoon of aloe Vera gel in a glass of warm water and swish around your mouth to freshen your breath and kill off bacteria. Find out how to use aloe vera and other natural ingredients to remove plaque and prevent gum disease. Regularly drinking green tea or using green tea as a mouthwash can help to remove oral bacteria and reduce bad breath. If your bad breath is caused by problems with your digestion, then taking digestive enzymes can help to eliminate bad breath for good. Taking probiotics may be one way of getting rid of the root cause of your bad-smelling breath. Many studies have shown that some probiotic strains are useful in treating H. pylori infections. Learn more about the many reasons to take probiotics and how they can strengthen your immunity. Taking activated charcoal is another way to fix bad breath that comes from your stomach. Did you know that you can also use activated charcoal toothpaste to whiten teeth and remove harmful plaque? Learn more about the benefits of using activated charcoal to address a number of health issues. If consuming foods such as garlic and onions has resulted in bad breath, you can try chewing on certain herbs to help mask the smell of bad breath. You can try chewing on some parsley leaves, mint leaves, or basil leaves after a meal to quickly help freshen breath and prevent bad odors from your mouth. Cinnamon is a natural antibacterial spice that also benefits dental health because it helps eliminate plaque and bad smells. Add 4 drops of cinnamon essential oil to a tablespoon of virgin coconut oil and brush your teeth. Spit out and don’t swallow. In my article “Why You Should Start Using Coconut Oil as a Toothpaste” you can also find a recipe for coconut oil and baking soda toothpaste. Or you can buy cinnamon chewing sticks online to reduce bad breath and support oral hygiene. Learn more about the amazing therapeutic uses of cinnamon and cinnamon essential oil. Zinc is an important mineral in your body and one that is also connected to having fresh breath and good dental health. Sulfuric odors are one of the reasons why your breath may smell of rotten eggs. Having bitter taste in the mouth could be just one of the signs that you suffer from a zinc deficiency. There are many essential oils that have antibacterial properties along with a refreshing scent that can help to quickly get rid of bad breath. 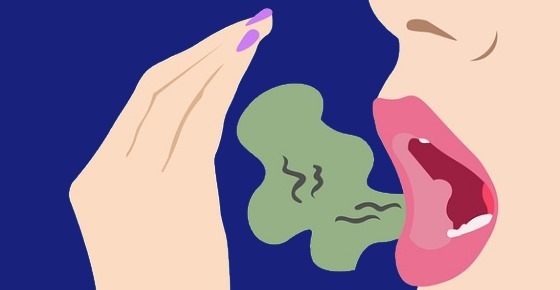 Here are 4 examples of essential oils that are good for bad breath. Tea tree oil. Many studies point to the antibacterial effect of tea tree oil in treating many oral diseases. One such study found that rinsing the mouth with a tea tree oil solution can help to cure bad breath by destroying oral bacteria. (26) You should not ingest tea tree oil because it is known to be poisonous if swallowed. To make the best mouthwash for bad breath, add 4-5 drops of your favorite essential oil to a glass of warm water. Mix well and swish around your mouth as you would a regular mouth rinse. Spit out after using. It is important to remember not to swallow any of the mouthwash containing essential oils. You can also use the antibacterial effect of hydrogen peroxide to eliminate bad odors originating from your mouth. Dilute 3% hydrogen peroxide with equal parts of water. Use as a mouth rinse for 30 seconds 3 times a week before brushing your teeth. You can also make a mouthwash to eliminate bad breath using baking soda (sodium bicarbonate). Since baking soda is alkaline, it neutralizes the acids in the mouth, thus reducing the risk of tooth decay and gum disease. Mix 1 teaspoon of baking soda in a cup of warm water. Swish the baking soda mouth rinse around your mouth for 30 seconds and spit out. If you feel that you constantly have bad breath, then it is important to make sure that you drink enough water. Researchers have found that a lack of fluids in the body can cause the saliva in your mouth to become thicker. This fluid deficiency can cause odors from your mouth to be more concentrated and smell bad. You can find out about the dangers of dehydration and why you should aim to drink around 2 liters of water daily. Because most of the causes of bad breath originate in your mouth, you should avoid consuming foods that are known to make your breath stink. How can you eliminate bad breath from foods you have eaten? In some cases, the only way to get rid of bad breath permanently is to see your doctor or dentist. If you have started taking medication and notice that your breath smells, then check if halitosis is a side effect of your medication.